Probiotic supplements have become all the rage in more recent times, with ‘good’ bacteria being employed for overall wellness results by manufacturers and consumers alike. One such particular product is Dr. David Williams Probio Serene, a dietary enhancer focused on providing gastrointestinal alleviation and, by extension, general improvement of health. Even so, when taking into consideration the vast majority of probiotic supplements available worldwide nowadays, you cannot help but wonder as a customer: what sets Dr. David Williams Probio Serene apart from the others? Does the ‘hype’ live up to the name? Why should you choose Dr. David Williams Probio Serene over other probiotic supplements out there on the market? What is Dr. David Williams Probio Serene and how does it work? Dr. David Williams Probio Serene is a probiotic dietary supplement aimed at restoring gastrointestinal functions at optimal levels. This is achieved by reducing discomfort within the gut, especially that caused by stress over time. Symptoms linked to visceral distress are often cramping, nausea, bloating, etc. Dr. David Williams Probio Serene is also advertised as a means to control cortisol levels (also known as the ‘stress hormone’) and a person’s ‘ability to cope’. Each package of Dr. David Williams Probio Serene contains 30 sachets of supplement in powder form. In addition, each sachet is promoted as containing 3 billion CFUs (colony-forming units) of probiotics, which are then released via the proprietary Advanced Probiocap micro-encapsulation technology. By relying on a slow-release formula, this product aims to maintain as many of the live cultures in a viable state when they reach the lower segments of the G.I. tract. This enables them to adhere to the mucosal lining of the stomach and intestines and therefore facilitate digestive transformations of all kinds. In order to promote digestive health, Dr. David Williams Probio Serene employs 2 main strains of probiotics in the shape of Bifidobacterium longum Rosell-175 and Lactobacillus helveticus Rosell-52. Both the Bifidobacterium and Lactobacillus groups of probiotics are renowned for their ability to promote regular bowel motility, reduce lactose intolerance, and even meliorate mental issues such as depression and anxiety. Still, you might be wondering by now: why are probiotics so important for human wellness? The short answer is that they influence almost every process inside your body in one way or another. The long answer is that probiotics – ‘pro-life’ or ‘good’ bacteria – exist inside the human gut since birth, where they colonize the entire length of the gastrointestinal system. Their presence then determines how well you decompose, then assimilate food and its subsequent nutrients, as well as how you respond to immune threats (since probiotics release antimicrobial substances). Moreover, the brain-gut axis determines the link between both your digestive and neurological systems, with a vice-versa influence of these two being the subject of many scientific studies nowadays. What is Dr. David Williams Probio Serene made up of? Bifidobacterium longum Rosell-175 – as part of the Bifidobacterium genus, this probiotic type has the capacity to thrive in an oxygen-free (anaerobe) environment. While not that predominantly present inside the adult G.I. tract, Bifidobacterium longum constitutes up to 90% of an infant’s probiotic count. This ‘good’ bacterium is transmitted from the mother to the child via natural birth, meaning that a C-section will therefore negatively impact the child’s original probiotic numbers. Taking into consideration that your initial probiotic configuration determines your digestive patterns for latter on in life as well, Bifidobacterium longum supplementation through breast milk or probiotic-infused formulas, for instance, becomes necessary in these cases. Bifidobacterium longum is crucial in these early years of development because it helps transform the lactose from milk into lactic acid, which is much easier to digest and then process into nutrients. In addition, lactic acid acts as a natural antiseptic medium, meaning that there will be a slimmer chance of developing overgrowths of pathogens such as Escherichia coli or Helicobacter pylori, for example. Increasing your Bifidobacterium longum intake as an adult can bring about a series of benefits, including (but not limited to) improved fermentation of amino acids, faster recovery from ulcerative colitis, and meliorated digestion of oligosaccharides (resulting in higher energy levels in time). Lactobacillus helveticus Rosell-52 – like all Lactobacillus members, this ‘friendly’ bacterium exhibits the capacity to produce lactic acid, which is currently being used as an advantage in a number of fields. For example, Lactobacillus helveticus is used in the dairy industry during the fermentation process of milk as a starter culture. As a consequence, many brands of buttermilk, kefir, and cheeses (Cheddar, Emmental, Gouda, Mozzarella, etc.) rely on Lactobacillus helveticus in order to reduce the bitterness otherwise associated with fermentation, to induce that particularly nutty flavour that characterizes them, and to facilitate lactose tolerance for those who will later on enjoy them. In terms of health boosting, Lactobacillus helveticus supplementation can be used to reduce lactose sensitivity, enhance digestion, and reduce abdominal discomfort. Moreover, Lactobacillus helveticus can stimulate the body’s own acid production (lactic acid, gastric acid, etc.) in order to prevent the formation and spreading of various viruses, fungi, and microbes. This antibacterial property comes in particularly handy because it ensures protection both in the case of food poisoning (E. coli being the most ‘representative’ such pathogen) and in other health problems that might arise from contaminated foods. Dr. David Williams Probio Serene also contains xylitol, maltodextrin, and malic acid, as well as traces of soy and milk. While xylitol and maltodextrin represent ingredients which are a normal part of the manufacturing process, malic acid is used to confer a fruity and sour taste to the probiotic powder in the sachet (in this instance, a grape/ plum flavour). Nevertheless, the presence of soy and milk traces can turn out to be problematic for those who suffer from the corresponding allergies. Mild to more serious reactions might be expected depending to your own sensitivity to these ingredients in particular. What are the advantages of using Dr. David Williams Probio Serene? Easy administration – as mentioned before, Dr. David Williams Probio Serene comes in the shape of powder-filled sachets. The label recommends taking 1 sachet/ day, either accompanying a meal or not (depending on your preference). The fact that you simply have to dissolve the powder content into your mouth – and not mix it with water or food – is obviously very convenient and practical. Additionally, the singular daily administration routine means you don’t run the risk of forgetting to take your probiotic dosage, as is the case with products which require multiple servings per day. No refrigeration – as stated on the label, the formula for Dr. David Williams Probio Serene is stable enough so as to not require refrigeration, which is definitely a plus. Most similar products advise in favour of keeping the probiotic cultures in a cool and dark place in order to maintain them viable for as long as possible. In the case of Dr. David Williams Probio Serene, the powder format combined with the product’s proprietary formula allow for more flexibility in terms of administration, meaning that you can even carry this supplement around with you on a busy day. Slow-release technology – Dr. David Williams Probio Serene’s Advanced Probiocap micro-encapsulation technology is employed to ensure the probiotic microorganisms reach the gut intact, where they can the adhere to the gastric and intestinal lining so as to form durable colonies. While the formula protection defends the bacteria against all sorts of harmful acids present at the gastrointestinal level, the technology itself is used to maintain the viability of the probiotics until they arrive at their intended ‘destination’. Few fillers and additives – aside from the two main probiotic components, Dr. David Williams Probio Serene only contains xylitol, maltodextrin, and malic acid. The presence of so few additional ingredients is an indication that the product is aimed primarily at delivering the guaranteed probiotic count (3 billion CFUs/ sachet). It also implies that the supplement leans towards the more organic side of composition, which is something you always want to come across for overall better health results. Extended customer guarantee – depending on your outlet of choice, you will most likely be linked to the guarantee offered by the manufacturer behind Dr. David Williams Probio Serene, namely a 90 days money-back deal. The advantage here is that, in the case that you are not satisfied with your experience regarding this probiotic supplement, then you can return your order within 90 days of purchasing and receive a 100% refund. Good probiotic selection – even though they are not very numerous, the Bifidobacterium longum and Lactobacillus helveticus strains chosen to be included in Dr. David Williams Probio Serene are nevertheless known for their positive contributions to digestion and immunity protection alike. As a result, they stand a better chance at ‘blending’ in with the pre-existing colonies, as well as the potential to alleviate lactose intolerance, promote abdominal wellness, and diminish other stress-associated symptoms. Does Dr. David Williams Probio Serene have any disadvantages as well? Bad taste – although the format of Dr. David Williams Probio Serene might be more appropriate for probiotic transportation and viability, the fact of the matter is that the chalky consistency might not be to everybody’s taste – especially since you have to dissolve it directly into your mouth and not in a cold dish or some water. Not to mention that the grape/ plum flavour is not necessarily a clear favourite among the wide public of probiotic consumers. Allergy concerns – the label for Dr. David Williams Probio Serene specifically states that this dietary enhancer contains traces of soy and milk in its composition, which does not agree with today’s allergy concerns. With more and more people becoming sensitive to these ‘problematic’ ingredients, it is important to note that this product can indeed be the cause of anything between mild and more serious reactions for allergen-prone individuals. Overpriced – while different outlets carry different prices for Dr. David Williams Probio Serene, the average amount of money you should expect to pay for this probiotic supplement is around $40. Therefore, at $1.33/ sachet, this product comes at almost double the average price for a good probiotic serving, which is generally agreed upon to stand at approximately $0.69-$0.70. Small CFUs count – in general, the human body contains anything between 1 billion CFUs and 100 billion CFUs, depending on the person’s own individual genetics, diet, stress levels, etc. Even so, the 3 billion CFUs provided by Dr. David Williams Probio Serene fall short of other similar products on the market, which can provide up to 25-50 billion CFUs as a daily intake. So, while the sachet’s potency might agree with a first-time probiotic user, they are not strong enough to provide a sustainable probiotic enhancement in the long run. All things considered, Dr. David Williams Probio Serene can be placed as a slightly above average probiotic supplement. The lack of probiotic potency and a higher cost than average are compensated by the product’s strain selection, slow-release formula, and simple administration routine, making it a good dietary enhancer to have for a good gastrointestinal and immune boost. So don’t be afraid to try out Dr. David Williams Probio Serene on your own and see whether this is the ideal probiotic supplement for you! 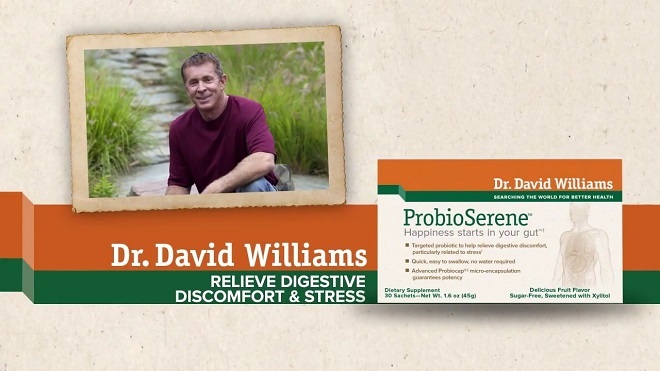 Be the first to comment on "Dr. David Williams Probio Serene"